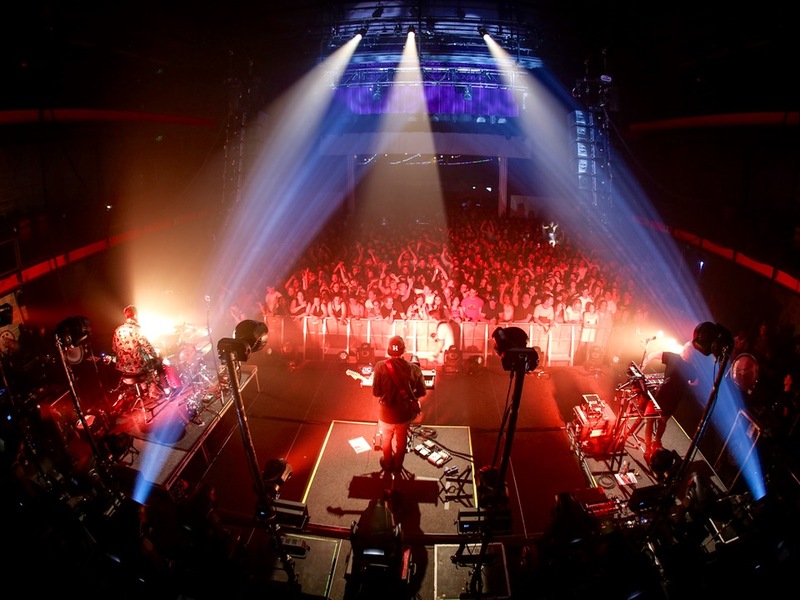 RÜFÜS is quickly becoming one of Australia's most in-demand live acts, and for their most recent tour, the band scaled up its audio quality with an Adamson E-Series loudspeaker system provided by Eighth Day Sound Australia. Following no less than five 2016 ARIA Award nominations (Australia's Grammys), RÜFÜS embarked on their Full Bloom Australian tour in early 2017, hitting 13 markets they missed during their last sold-out run through the country. Wanting to make a statement with a show that reflects their growing stature, the band brought out the Adamson E-Series solution. Systems Tech Chris "Chopper" Morrison, who works with top touring acts including The Who, had encountered Adamson's E15 three-way, true line source loudspeakers at some of the bigger music festivals around the globe and was thoroughly impressed by their performance. "I always wanted to work with an Adamson system more extensively as my experiences with The Who during the festival season were really good. The E-Series is extremely linear and it takes very little work to get the box sounding great," shares Morrison. "On top of that, the Lake software offers in-depth and precise control in case you need it. The system outperformed my expectations on the road with RÜFÜS, even in the most challenging environments." The first outdoor show took place on the Sunshine Coast at the Big Pineapple. Due to limited rigging loads, an E12 main hang was used in conjunction with a horizontal array of E119 subs and S10 outfills. "It was really impressive for such a small array, with very linear, smooth low end," comments FOH engineer Cam Trewin about the more compact E12s. On the next stop, though, they scaled up to the E15s "and they were absolutely ripping," enthuses production manager Steffan Johnson. "We were excited to use our new Adamson E-Series arrays on the recent RÜFÜS Australian tour," comments Damo Pryor, General Manager of Eighth Day Sound Australia. "We received rave reviews about the quality of the sound across the board, from the FOH engineer and the tour promoter through to the fans. Adamson's audio performance and global rider acceptance is keeping our system very busy, making the investment in Adamson to service the Australian market a wise and rewarding business decision." Photo: Adamson E15 arrays on RÜFÜS' Full Bloom tour by Jack Lawrence.